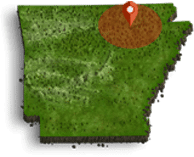 November 15, 2018 – This year marks the third annual ‘A Very Melba Christmas’ presented by the Melba Theater of Batesville, with the assistance of local business partners. The past two Christmas seasons have brought thousands of movie goers from far and wide to see old classic films on the big screen. 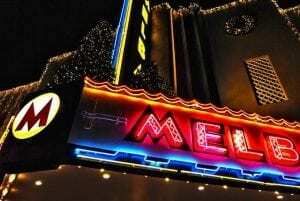 For many, attending the Melba has become a holiday tradition. Theater Owners, Adam & Mandi Curtwright and Joe & Janelle Shell try to bring something new and exciting each year, aiming to fulfill their mission of offering “An Experience to Remember”. Adding to the overall experience last year was fake snow. Thanks to Precise Heating & Air, Mandi Curtwright’s dream of a snowy Christmas came true. “We wanted to create something to take our movie goer’s experience over the top and the fake snow was perfect!” Mandi said. The machines were sponsored by Precise and were positioned above the marquee so that as attendees exited, they would walk out to a gentle snow fall. “It was magical!” Mandi exclaimed. It has also been confirmed that Cousin Eddie and his rundown RV will be back as well. Each year Brad Cheatham has donned the bathrobe and entertained guests as they wait in line. It would be hard to estimate just how many pictures he has been tagged in on social media. The Leg Lamp will reappear in the ticket booth window and other surprises will surface during the series as well. It is safe to say, you’d better mark your calendars and make plans to attend as seats fill up quickly.